I have another addiction beyond digital media – BBQ and Grilling and yes, there’s a difference. BBQ is generally speaking cooked “slow and low” over smoke with chicken, pork, ribs, and brisket being the most popular types/cuts of meat. Grilling is done fast and over direct or indirect heat and cook time is generally measured in minutes vs. hours for BBQ. Both are experiencing a renaissance in interest as well as technology. From BBQs that tweet on Twitter, to decidedly low-tech solutions with big taste results for the casual gas grill owner. Hello, my name is Sean, and I’m a BBQ addict. My journey started in college when I learned what good BBQ is about going to school in-between Kansas City and Texas. Then, in 1998 after finding mass-market BBQ in Seattle, I started buying Lloyds vac-packed, pre-cooked and sauced ribs and bringing them to friends’ parties (cringe). This was the low point in my addiction. From there in 2000, I started reading up and playing around with an electric smoker. After seeing my electric bill, I moved on through multiple smokers and grills – propane, natural gas, charcoal, and lump all have seen time in my “pit”. In the past four years, I’ve really taken delight from feeding our friends throughout BBQ season from Memorial Day to Labor Day here in the states and have helped to organize a local event. But the reality is I grill and BBQ year round – Prime Rib roasts for Christmas, Turkey for Thanksgiving and everything in-between. A few friends have suggested I compete in local BBQ competitions and I’m flattered. These weekend-long events often involve cash purses up to $10,000 – not bad for a weekend of camping and cooking in a parking lot. I’m not really equipped to do this and figure I’m still backyard quality. Then a few weeks ago, a friend signed up to become a Kansas City Barbecue Society certified Judge and suggested I do the same. There we met 75 other people like us, all looking for the best BBQ the area has to offer. As a result, I ended up judging the NW barbecue Championship last weekend, ate some great BBQ, and learned a lot throughout the experience. I’m still learning, but have set my sights on a new prize – judging in the Kansas City American Royal Invitational with a $30,000 purse which draws over 300 teams and 60,000 people each year. Here’s my list, just in time for Father’s Day and open grilling season. I’ve also included links to some of my favorite products to aid in discoverability. Many of these items you can find at local outlets as well. Aluminum foil will work in a pinch, but the best approach is a dedicated smoker box. Fill with wood chips (not chunks) that you’ve soaked in water for roughly 30 mins. Then put this on your grate or directly on the burner of your Gas grill and infuse chicken, ribs, steaks etc. with great taste. Smoke imparts a distinctive taste and can really open up the flavor of any meat. The challenge is pairing the right wood smoke with the right meat/marinade/rub. One of my favorites and most versatile is oak wood. It’s not overpowering and you can find wineries and distilleries that run their oak wood casks for aging through a wood chipper. Wine barrels impart a stronger secondary “flavor profile” than Jack Daniels or others. This one is a must-have and worth every dollar for any cook who takes food safety seriously (and you should). NSF-certified and calibrated, it instant reads the temperature of just about anything. I use it for testing doneness of chicken, pork, tri-tip and even boiling water and grate temperatures on the grill. Cast iron is incredibly easy to use on the grill or campground and get a bad rap for being difficult to clean. I’ve been really happy with the Lodge Logic pre-seasoned skillets and found them to be the opposite – just scrub with water and once dry, throw a little cooking oil on a paper towel to re-season. Awesome for fajitas, veggies, bubbling cheese dips in a smaller skillet and everything in-between. If you’re getting the skillet, be sure to get these. I made that mistake only once grabbing a hot handle. Easy to use, not much more to say about this one. A great how-to guide and cookbook, you don’t need to own a Weber in order to learn from this book and time-tested recipes. These are just a few suggestions, and don’t forget the fire extinguisher. 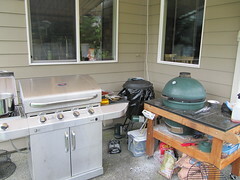 This summer I’ll be working on improving my outdoor kitchen, getting more organized and trying new products and recipes. In my next piece I’ll go to the extreme end of the geek BBQ spectrum with the latest rage – a computer-controlled BBQ system that tweets status of your cook on the Web. Also if you’re in the area, be sure to check out the PNW Eggfest happening next weekend, stop by and say hello. Ed. Note: This is a departure from my usual sporadic musings. Please feel free to share topics, questions, or feedback on whether this is of interest as a topic here or a separate blog. Some really good tips in here, Sean….thanks. How about some grilling recipes and/or sauces and rubs?